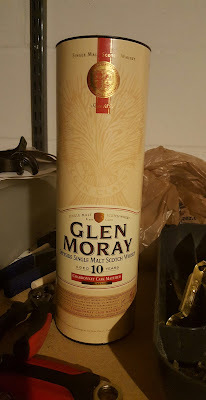 If you want to be hip, you should pronounce the 'Moray' in Glen Moray like murry, as in Eddie Murray, Brian Doyle Murray, or the last name of that creepy guy in the white fedora who releases annual press releases that screw with the whisky market. Yeah, I had the same feeling as many of you when I saw the 10 year old Chardonnay Cask on the shelf. Though I don't hate wine cask finished whiskies, I also do not seek them out. And I don't always drink Chardonnay, but when I do I drink the unoaked sort. There's some orange in the color's gold. Hopefully that's not farbstoff. A lot of peach and apricot in the nose, followed by fruity chewing gum. No, wait...Strawberry Bubble Yum. Dried grass clippings, roses, and lime sorbet. Whipped cream, marshmallows, and a creamy maltiness. A surprisingly vibrant palate led off by coffee + toffee. Pineapple juice and marshmallows, yet not super sweet. Malt and a gingery zip. Some extra ripe melon in the midground. Very moreish (as I used to write). The coffee + toffee remains in the finish. Then a roasted note, a subtle herbal thing and a hint of oranges. Utterly charming. I have no idea where the chardonnay is hiding in all this, but the cask steered the whisky in a completely different direction than the regular 12 year old. If I'm going to gripe then it would be regarding the short-ish finish, but that's it. Though there's minimal complexity to it, the whisky is, dare I say, very tasty. And it can still be found for $30. Unfortunately I'm seeing the new NAS "Chardonnay Finish" showing up more often, so perhaps we're all looking at our last opportunity to buy this little old gem. Oops, I linked to the NAS - thanks for pointing out the distinction! Unfortunately the 10yo also has Zuckerkulör.